I like Gru a lot as a character but I find I am getting bored of his adventures. I took a moment to stop and really about that sentence after I typed it. It is the sort of line that I use as a launching point to a review. For those who are unaware, a writing practice many critics have is that they will write the most obvious statement at the beginning of a review, do more in-depth analysis later, and then fix the opening while completely removing the obvious statement. Because the point of a review is to not give away too much too soon, and there’s no reason to be so obvious about something. Yet my launch line stays intact. Mainly because “Despicable Me 3” makes no effort to be organic or subtle either: It is what it is. That was a strength for the previous film but not so much this time around. I’ve been thinking about why it is that “just good enough” managed to get three stars from me for the previous two films and not this one is a question I’ve been struggling to answer myself. I hope to finally do so with this review (though I admit this is going to be more of a self-examination piece than an actual analytical one). The movie opens with great energy as Gru (Steve Carell) and wife Lucy (Kristin Wiig) are summoned to stop a supervillain from stealing a massive diamond. The villain – Balthazar Bratt (Trey Parker) – was once a child actor who was on a hit sitcom where he played a supervillain who used robots and expanding bubblegum to steal cool stuff. After puberty got the show cancelled, Bratt ended up becoming the villain he so frequently played on TV. From this description can probably surmise that I am was more interested in seeing what happened with Bratt than I was with Gru. Bratt is fun, lively, and has a unique background that makes him likeably and compelling all at once. For that matter, this was once the case for Gru. 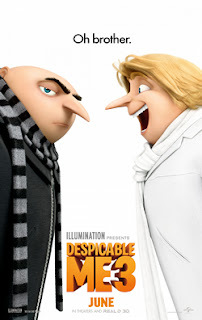 The issue I find with Gru is that while he himself has not lost what made him so charming (even during his bad guy days) he is in a situation where he must grow as a character…but he must do so in a series that is unwilling to evolve. So much so that we discover Gru has a long-lost twin brother named Dru (Carell again), who has lots of money and (wouldn’t you know it?!) wants to be a villain who steals things himself. For that matter, even the Minions are frustrated by Gru’s lack of doing anything remotely interesting, and thus spend most of the movie on strike, doing random things that never amount to anything important that I can see. They are, in short, just around because people like to see them at this point. For that matter, “Despicable Me 3” is a product from a company that is known for doing the bare minimum to entertain their audience. With the first movie, the central characters were Gru, the three adoptive daughters, and the villain. The Minions and a few other side characters were thrown in to help flesh out the ideas, but in the process Gru has gained a wife. Has a family. New villains have been introduced. Now we have a twin brother who is basically the person Gru was before he became domesticated. Add in the fact that the movie is juggling the girl’s reluctance to accept new mom Lucy and her problems with being – well, a mom in general – and “Despicable Me 3” ends up being a movie that is doing way too little with way too much. This is a movie that demands to breath. To be more than what it currently is. Heck, they have one of the South Park creators on board, yet, somehow, the humor is always playing it safe (and the lesson is so bland Parker may just go back and lampoon it on his own show). Parents, there are a few bare butts from Gru and the Minions, but not a whole lot else. Recommended for ages 5 and up.